Scare the guy next to you at the gun range with these targets! "Damn Marge, is that guy covered in grape jelly?" Better yet, yell out "Braaaiinnns" every time you get a hit. The range master will love you for it. A 6 pack of these targets will set you back $9.49. Practice your Zombie-stopping skills with this new line-up of fun and engaging reactive targets. 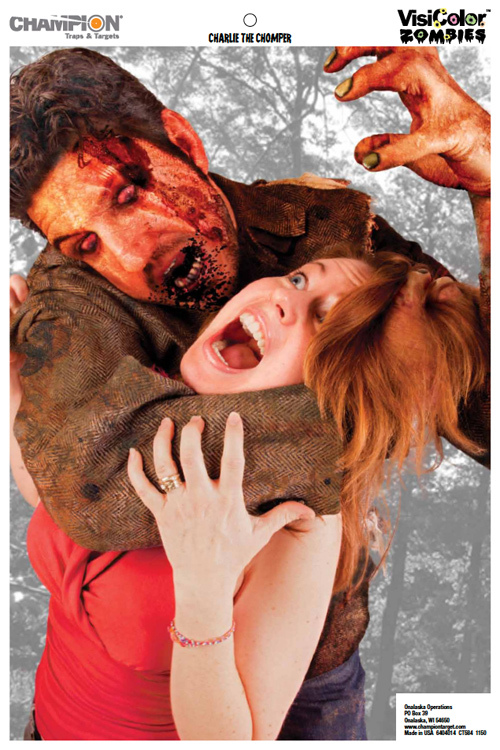 Using vivid, movie-quality, digital imagery—no other Zombie targets on the market are quite like them. Equipped with VisiColor technology, the heads of each Zombie react to reveal a radiation green color and Zombie bodies react in fluorescent yellow upon positive hits. Misses and accidental hits to hostages react in white. Get yours here. Now with more grape jelly!